The Interview With Anonymous UK. With All the latest Anonymous activity in the Media i have managed to get an interview with Anonymous UK. And these people need the backing of the less computer literate people off the streets ,general public, viva Anon keep it up. Anonymous UK...Given how the numbers vary on different operations as well as the fact that anons can have multiple accounts on various sites, I'd say it's impossible to tell how many there are. Some significant numbers have been shown at various points. Back in February 2008, over 9000 anons (and that isn't just a meme reference) attended worldwide protests against the Cult of Scientology. In 2012 we saw thousands of anons using the LOIC to bring down sites in retaliation to the MegaUpload takedown. But these are only the people taking part in one operation at one time. The number's growing by the day, and all it takes is someone to put on the mask, sign their message as Anonymous, or take part in an operation, and that's another. We definitely don't all have the same aims. There are some generally shared ideals: freedom, anti-censorship, anti-suppression. But nothing is universally supported, and many ops may only be supported by a minority, but that doesn't matter - all it takes is enough people to be on board. I wouldn't say there's an overall aim beyond the basic concepts: Ideas are judged on the merit of the idea alone and not on the author. Everyone is free to do what they want, there are no leaders. And always do it for the lulz. Anonymous UK...The extradition treaty is ridiculous and unbalanced. The US does not need to prove anything to the UK court for an extradition, whereas the UK would need to in order to request extradition of a US citizen. We shouldn't forget that these laws were developed with the excuse of terrorism, so to use them for supposed copyright infringement is laughable. But that's an all too familiar thing - laws designed for violence and terrorism are also used by police for policing protests. The extradition of UK citizens when the crime didn't even take place in the US is taking it even further. If they are in the UK, they should be held accountable to UK law and get a UK trial. For example, Richard O'Dwyer's case got dropped by UK prosecutors because what he did isn't illegal - he didn't host copyrighted content, his site just contained links. However, he is still being extradited under US laws even though he and his site were in the UK. Anonymous UK...We don't all have the necessary skills for that, some of us may do. We'd only know for sure if and when Anonymous decides to do so. Anonymous UK....That depends which attacks you mean. There are attacks on many companies which deal with copyrights due to their support for laws such as ACTA, which would be a lethal blow to internet freedom, free speech and would introduce major surveillance and censorship just so that these companies can protect an antiquated system of making profits. There have been attacks on law enforcement agencies for various reasons - such as the seizing of megaupload and surrounding arrests, the arrests of Anonymous members, the tactics used against protesters. There have also been attacks on various other targets, some because of their actions, some simply for the lulz. There is a lot more to Anonymous than simply taking down sites, however. Feds can't possibly do anything detrimental to them so why did he turn. Anonymous UK....He faced spending his life in prison. I imagine that would be enough to swing many people, especially those with kids. It's very hard to say when we don't know what they said to him or the circumstances, but it's very easy for people to say they wouldn't crack under those circumstances, until they face it themselves. My opinion is that if someone knows enough about you to turn you in, you're doing it wrong. Anonymous UK...Nope. Anonymous will continue so long as people wish to act under the Anonymous name. Anonymous UK....There are many incarnations of what people believe the NWO to be floating around the web. I personally don't, but think that if such a thing did exist there wouldn't be the evidence available to convince me. Anonymous UK...Anonymous's origins had nothing to do with governments or the state of the world. Anonymous came from the dark corners of the internet. E.g. 4chan. It moved on from small lulzy operations (habbo raids, attacking other sites/chans, lots and lots of trolling) to big things when Project Chanology began, the worldwide war on the Cult of Scientology which continues today. An increasing number of operations of various sizes using various methods have followed, and Anonymous has developed and grown ever since, now representing the most diverse range of projects and operations we've ever had. Anonymous UK...I do believe that the money pulls the strings, and that modern democracies in the UK/US for example don't work to sufficiently represent the people. Anonymous UK.....Different anons run different systems, though I expect that Windows / Linux are the preferred options for most. Anonymous UK.....There are many meeting points for different cells and operations. Various websites, IRC (chat) channels, imageboards etc. 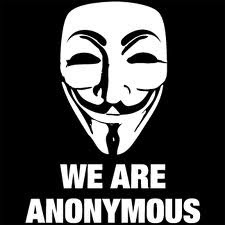 Anonymous UK....Some of us do, especially those involved in IRL activities. Anonymous UK.....There's no 'meeting' on 4chan really, since everyone's Anonymous, but operations can be planned on 4chan, and people can be directed to various sites or chats from 4chan. As mentioned earlier, the first major project did originate from 4chan. Thank you Very Much Anonymous UK and keep up with the Work your doing Some of us back what your doing and appreciate it. A 150-foot asteroid orbiting Earth called 2012 DA14 will pass so close to Earth it will fly UNDER man-made satellites orbiting our planet. Nasa's Impact Risk report said that the odds of the space rock actually hitting our planet are very low indeed - but on February 15 next year it will pass just 17,000 miles from Earth, closer than 'geostationary' satellites. If an asteroid of that size hit our planet, it would cause an explosion similar to a nuclear blast. I for one do not trust NASA as they are not very observant ,and more government sided as in they would warn certain people but not the masses ,to leave our very lives in the hands of these people is nothing but lunacy,Two astronomers from the the Observatorio Astronómico de La Sagra in Spain spotted 2012 DA14 in late February and its orbit has been calculated to be very similar to Earth’s. Some reports suggested that on February 15 next year an impact was a possibility, but U.S astronomer Phil Plait, the creator of the Bad Astronomy blog, has ruled out an impact. 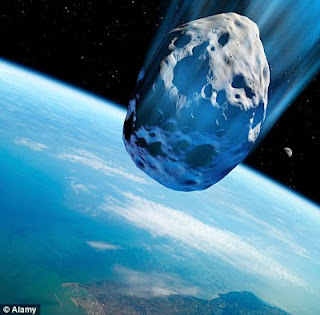 He wrote: ‘Asteroid 2012 DA14 is almost certainly not going to hit Earth next February. And by “almost certainly”, I mean it. The odds of an impact are so low they are essentially zero. This does not rule out an impact at some future date, but for now we’re safe.’ Now how much of that comment is believable sounds just like a well rehersed speech and hopeful thinking ,The space rock will come within 17,000 miles of Earth, which is closer than some of our satellites, but Plait says this is nothing to worry about. After next year, 2012 DA14’s closest brush with Earth will come in 2020, but Plait said that even then the odds of an impact will be less than the chance of being hit by lightning in your lifetime – 1 in 100,000. Last night a space rock caused panic across the UK, with police forces inundates with calls after spotting it in the sky and mistaking it for a burning aircraft. Police forces across the UK were inundated with calls last night after a large fireball, thought to be a meteor, was spotted in the sky. Reports of a 'bright light' and an 'orange glow' were received by police across Scotland and the north of England at about 9.40pm yesterday. The Kielder Observatory also reported the sighting of a 'huge fireball' travelling from north to south over Northumberland.